Welcome to Nature's Lens. The purpose of my photography is to renew and encourage relationships with nature. These portraits are a window into nature as well as a reflection of ourselves. My brother, Paul, tells me "Anne, you have a way of finding the mystical in the mundane." As I reflect on this, I realize nature simply is mystical and I am awestruck by it. Connection with nature for me is a very personal and spiritual reality. These photographs are a view into my world. This glimpse is only the beginning of a journey into the wonders of Nature’s Lens. Come join me for a stroll! A portion of all proceeds goes to the Camp McDowell Environmental Education Center, which awakens children to a sense of awe, wonder, and connection to the natural world. Nature's Lens is committed to renewing our spirit through seeing nature. Anne K. DelBene has been doing photography since 1999. She became fascinated with the interaction of light, texture and depth, and was intrigued by the challenge of creating images that would awaken viewers both to the beauty around them and to the beauty inside themselves. Connection with nature, for Anne, is a personal and spiritual reality. Anne has a deep-seeded passion for the natural world. Strolling through the woods or watching a sunrise, she is often filled with a sense of awe, wonder and belonging. The way the light shines on a leaf, the emergence of a new flower, evoke an opening of her heart to see qualities of her self mirrored in the leaf or flower. The purpose of my photography is to renew and encourage relationships with nature. These portraits are a window into nature as well as a reflection of ourselves. 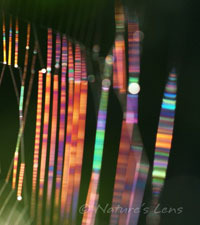 Nature's Lens is committed to renewing our spirit through seeing nature.